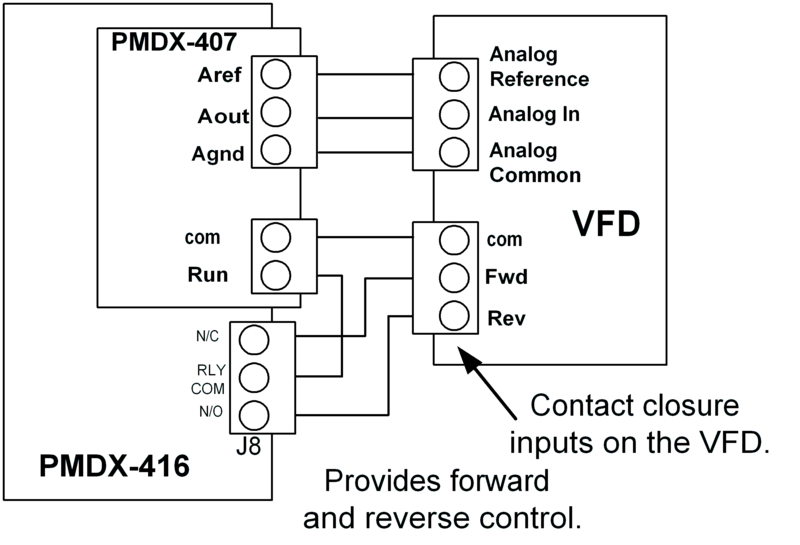 The PMDX-407 has a single pair of solid-state switch contacts that can be used to turn the spindle on or off. The switch contacts close when the spindle should be running, and they open when the spindle should stop. In order to have the PMDX-407 control the spindle direction you will need an additional SPDT relay, such as the one on the PMDX-422, PMDX-416 or PMDX-424, all of which the PMDX-407 can plug directly in to. If you are using the PMDX-407-S (the stand-alone version NOT plugged into a PMDX-SmartBOB), the addtiional relay can be the relay on the PMDX-122 or the SPDT relay on the PMDX-126. The Com on J2 of the PMDX-407 should connect to the Common of your VFD interface. If you have the VFD working now, you have already done this. The Run on J2 of the PMDX-407 should connect to the relay Com on J8 of the PMDX-422 or PMDX-416, J18 of the PMDX-424, or the Com terminal of any break-out board with a relay or any external relay that you may add to a board that does not have one. Connect the relay's N/C (normally closed) contact to the FWD input on your VFD. Connect the relay's N/O (normally open) contact to the REV input on your VFD. If you are using an external relay (other than the relay on a SmartBOB), then connect an output signal from your breakout board to the relay's coil (WARNING: DEPENDING ON THE RELAY YOU MAY NEED ADDITIONAL ELECTRONICS BETWEEN YOUR BREAKOUT BOARD AND THE RELAY'S COIL - that is beyond the scope of this FAQ). The Enable column should have a green check mark. The Device column should be set for your SmartBOB device. The Output Name column should be set to Relay (or other pin name if you happen to be using an external relay that you have added). The output name Relay will not appear in the list if you have any other output set to use that output name. The Active Low column should have a red X unless you have the FWD and REV swapped in your wiring. There is no need to configure the Spindle Fwd or Spindle On signals. The SmartBOB plugin is receiving these signals directly from the Mach4 software API.